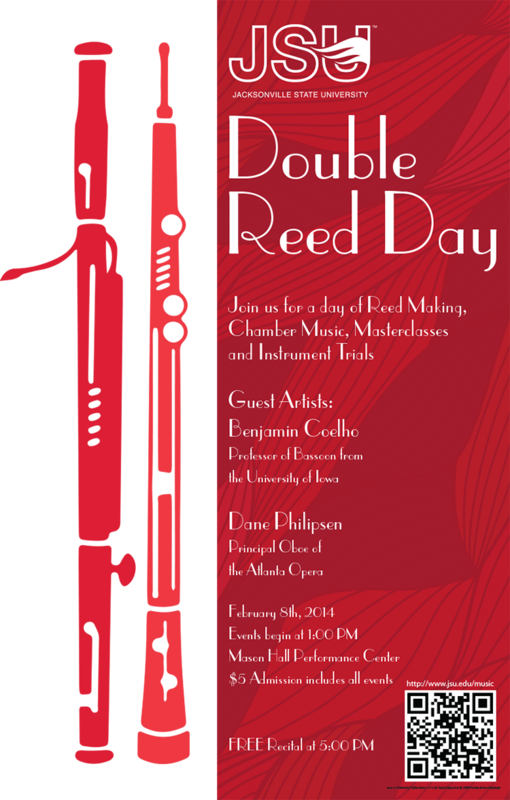 WELCOME TO JSU DOUBLE REED DAY 2014! The day will be filled with Reed Making, Masterclass, Chamber Music and plenty of opportunities to ask questions and find answers. The cost of the day is $5 and Registration begins at 12:00 Noon on February 8th. There is a FREE RECITAL at 5:00 PM Featuring Dane Philipsen, Benjamin Coehlo, Rebecca Collins and Eryn Oft (me). We will have Carlos Coehlo Oboes, Oxford Reeds, Miller Marketing Products, and Raffe Reeds available for instrument trials and purchase of accessories. Proceeds are funding our Growing Supply of Reed Room Machines and the purchase of an English Horn.